Sadly it it is true that many people don’t get on well with a vegan diet and get very ill on it. Not an ethical justification obviously, but a plain statement of fact. 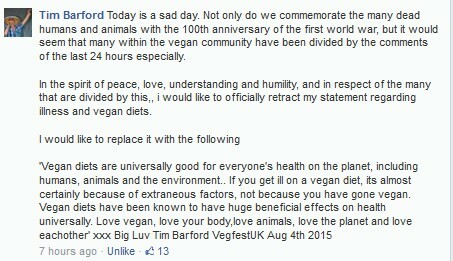 As Tim mentions in the above comment, he has agreed to come on Go Vegan Radio with Bob Linden on August 3, 2014, to discuss this with me. If you are not vegan, please go vegan. Going vegan is easy, better for your health (as a matter of plain fact) and the heath of the planet, and most important, it is what we owe morally to nonhuman animals. On August 3, Tim Barford and I discussed this issue on Go Vegan Radio. The discussion can be heard here. During the discussion, I asked Tim to retract his statements. 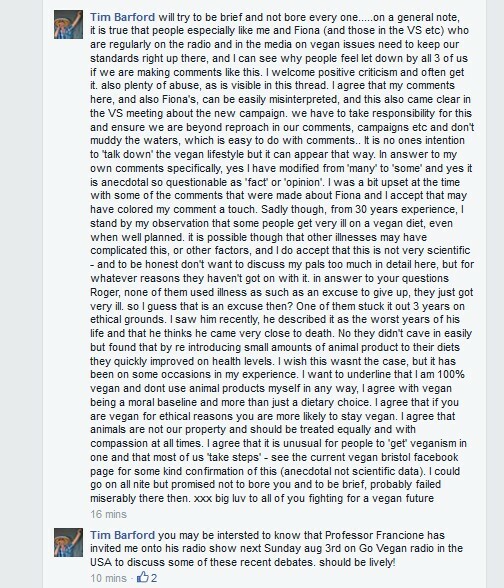 Neither Fiona Oakes nor Vegan Society CEO Jasmijn de Boo participated in the discussion despite being invited by Bob Linden. This is, to say the least, most disturbing.